This past Valentine’s Day, I went to dinner at Bergamot in Somerville, MA with two friends and my girlfriend on the day before Valentine’s Day to beat the rush. I picked the restaurant because it had pretty good reviews and someone recommended it to me although I can’t remember who it was. Nonetheless, before we even got to Bergamot, my friends and I were already having fun with the name. The morning of our dinner, I was in the shower and couldn’t stop laughing as I kept singing the three-syllable name, “Bergamot,” with the same mechanical sing-song phrasing of N’SYNC’s “Dirty Pop.” Why? I don’t know. I’m not a morning person and this helped me get through it. Whatever. Leave me alone. 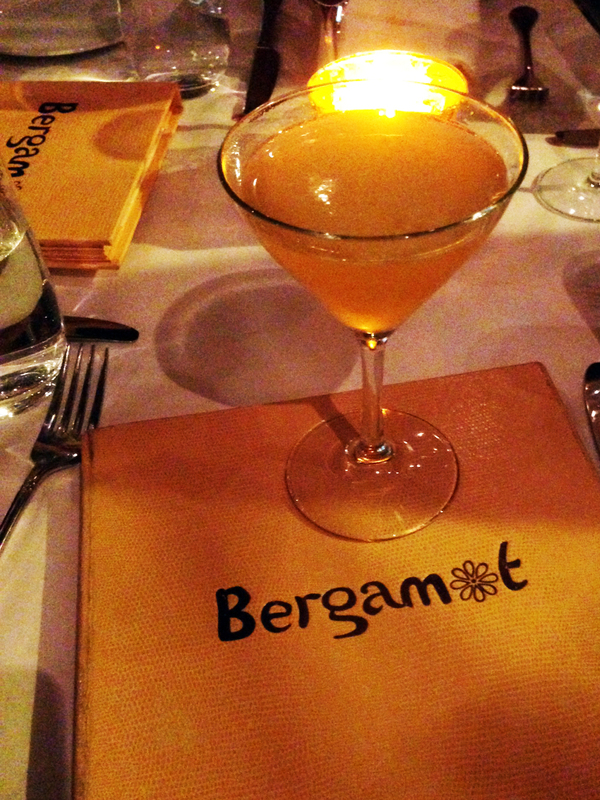 With all of the laughter going in to the experience, Bergamot already had a head start on the evening. We ended up having a really enjoyable dinner, so on to the review! 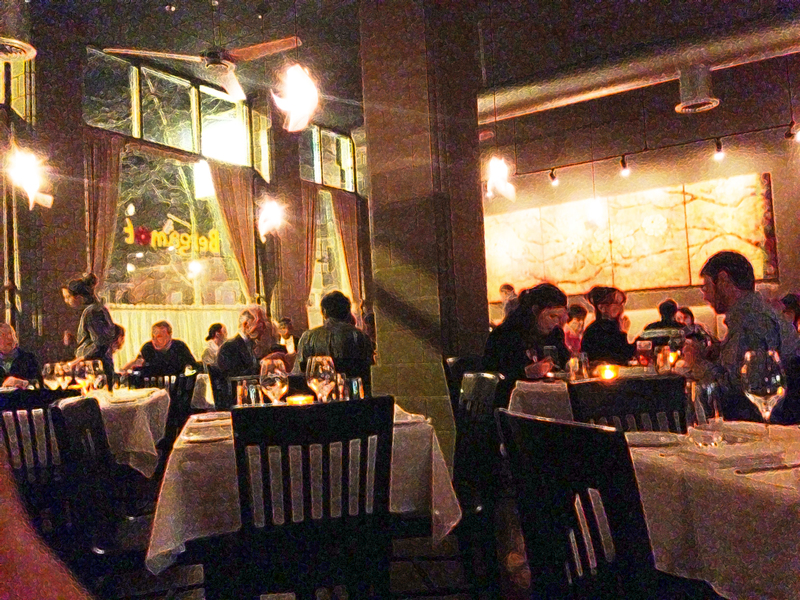 When my girlfriend and I arrived at Bergamot, we entered and pushed aside a curtain to get into the restaurant. I’m not a fan of curtains at front entrances because they muss you up as you walk through them, but I do understand their usefulness on cold days because they create a kind of mock air lock. As we stepped inside the hostess greeted us politely and I told her that we had a reservation for 4 people. She noted that half the party arrived and asked us to wait for our two friends. That’s all pretty standard. The weird part occurred when I asked if we could grab a drink and wait at the bar. She turned around, looked at the bar in the far back left of the restaurant and said, “Sorry, the bar looks full.” All of the seats were taken, but I was a little confused as to why we couldn’t just stand near the bar having a drink when there were two other people just standing near the bar too. Rather than explore this though, we just went and stood behind the host table waiting for a seat to become available on the waiting couch. This picture makes it look much brighter in there than it was. Ah, the wonders of photo editing. From behind the host table, I could see the entire restaurant. Towards the entrance there are large windows that let in the best light in the restaurant. Otherwise, the restaurant is a little too dark in my opinion (sorry for the dark photos below) in stark contrast to their bright yellow sign and menu. In the back right of the restaurant there is a semi-open kitchen where you can see the chefs and line cooks working to prepare the food. It isn’t a true open kitchen because there are no tables near the window, but you can see inside. I thought this was an interesting touch to the restaurant that sort of made it feel comfortable even though they were serving higher end food. When our friends arrived and we were seated, our server was very attentive and allowed us to move at our own pace. She recommended the Prix Fixe Menu for $39, which consisted of an appetizer, an entree, and a dessert. The most interesting thing about Bergamot was the pace of the meal. As a native of the Northeast U.S., I’m used to the fast paced environment. People walk quickly, everyone is in a rush, and meals are inhaled rather than eaten. At Bergamot, the atmosphere was different. We not only took our time, but the meals didn’t come out one on top of the other as many meals do in restaurants. Instead, there was actually some time between dishes that allowed my friends and I to talk, enjoy our cocktails, and remark on the food we just ate. You wouldn’t want to eat here if you were in a rush, but if you have the time, the pace is very leisurely. If I had to summarize the food at Bergamot, I would have to go with high class Southern comfort food. That may not make sense, but it will once I tell you that I got the “Chicken and Dumplings” for my appetizer. If you’ve ever seen Chicken and Dumplings then you know that the picture above isn’t typical. Normally you get little lumpy pieces of dough dumplings mixed with pieces of chicken and slathered in a thick, creamy sauce. 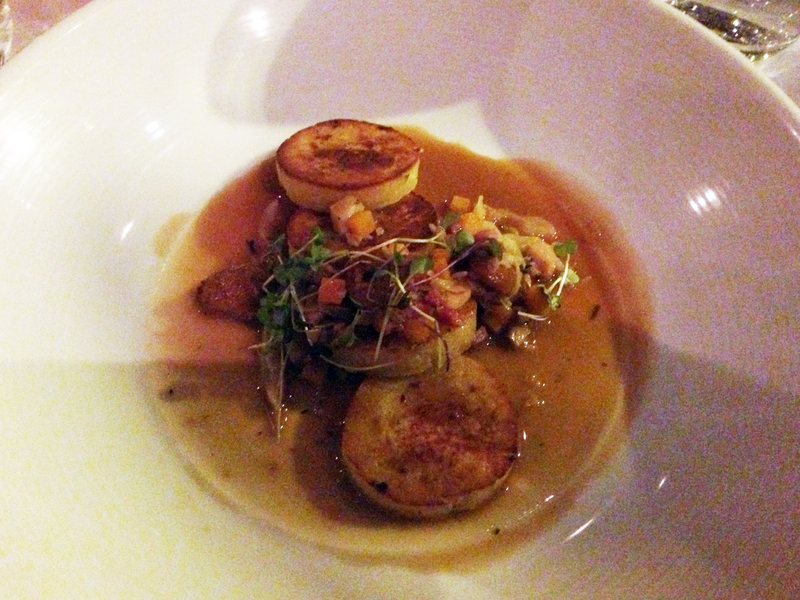 The chicken and dumplings at Bergamot were disc-shaped like flat scallops and seared in much the same way. The chicken was either mixed into the disc-shaped dumpling or lightly shredded in the garnish. The dish had a ton of chicken flavor from the dumplings and the chicken gravy, but for the life of me I couldn’t really find the chicken itself. The portion was small, but very tasty without being too heavy. When I ordered this from our server, she enthusiastically told me that I’d made the right decision. 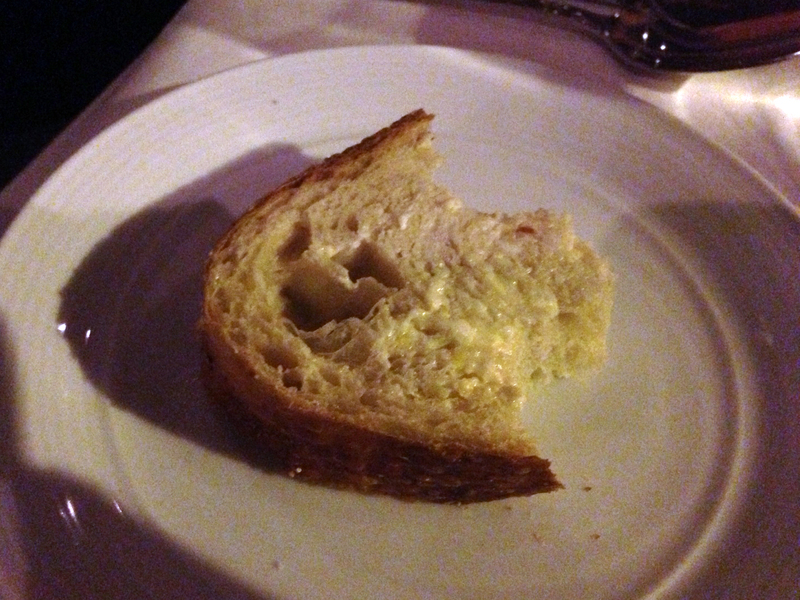 Prior to getting our appetizers, our server brought us fresh rosemary bread and a lemon creme fraiche butter spread. The bread was crusty on the outside and soft on the inside (as it should be) and the lemon creme fraiche spread really complemented the rosemary in the bread. When trying a new restaurant I enjoy sampling one of their unique cocktails to get a sense of how good their bar is. After that, I usually just go and stick to a classic. My first cocktail of the night was an easy choice because it featured Reyka vodka, which I’ve enjoyed ever since taking a trip to Iceland. The Beacon Fix also had lemon, Luxardo Tripium, and Bergamot Rooibos Syrup (which is apparently some kind of tea). I very much enjoyed the drink because it was very tart, but also sweet. It went really well with my meal simply because it reminded me a bit of lemonade, which I’ve always thought goes well with Southern style food. After the Beacon Fix, I ordered a regular, extra dry, vodka martini, which was pretty good. I was disappointed with the olives though because they weren’t large/Queen Spanish olives, but instead those cheap little ones that have no business being at a good bar. I had a hard time choosing an entree because many of the dishes looked really good. The menu didn’t have very good descriptions of any of the meals though. It would list the main protein of a dish and then just list what else came with the dish, so you had no idea how the focus of the dish might be prepared. In the end, I went with “Pork Two-Ways,” but I had no idea what “two ways” or what cuts of pork I would be getting. When it came out, I immediately identified pork tenderloin as the main ingredient, but had a little trouble figuring out what the second pork preparation was. It was little tiny cubes of what might have been pancetta or some kind of unsmoked pork belly. It tasted good, but the little bits of it weren’t really enough for me to consider it pork two-ways. Really it was pork one way with some chunky unsmoked bacon-like pieces on top. With that said, the pork tenderloin was cooked perfectly so that it wasn’t dry, but also wasn’t too chewy. Unfortunately, I wasn’t a big fan of the side dish/garnish. 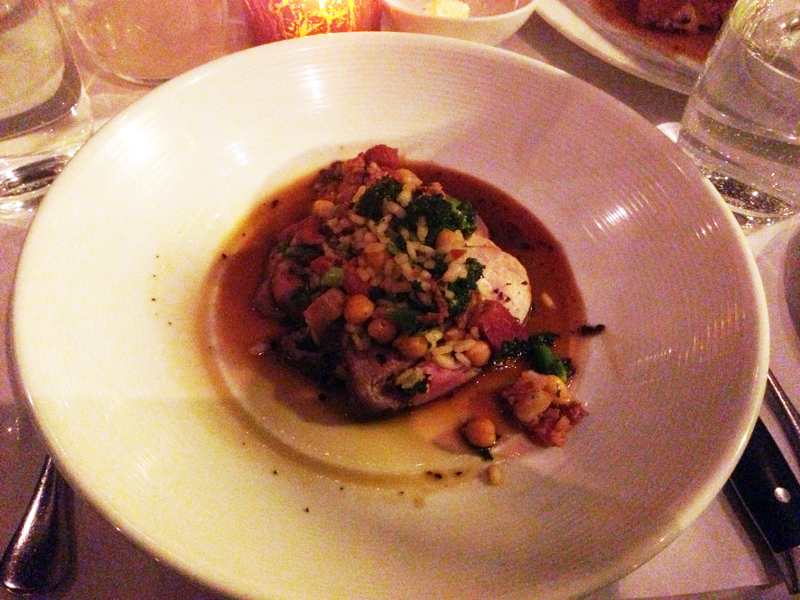 It came with broccoli rabe, chick peas, carnaroli rice, “olive dust,” and roasted pork jus. The rice was ok, but I wasn’t crazy about the texture. The rest of the sides/garnish were average, but I thought that there was way too much mustard in the broccoli rabe. I love broccoli rabe, but other than the texture of the vegetable, I mostly tasted just a lot of of mustard. My friend also got the pork and he really enjoyed it, so it’s probably just a personal preference when it comes to the textures and the amount of mustard. If I had it to do all over again, I would have went with the Roasted Chicken, which tasted incredible. I don’t normally order chicken at restaurants because sometimes it’s dry and I can just make it at home, but the chicken at Bergamot was very well done. Lastly, I ordered the Devil’s Food Cake dessert, which had a really nice presentation with a lot of different textures on the plate. 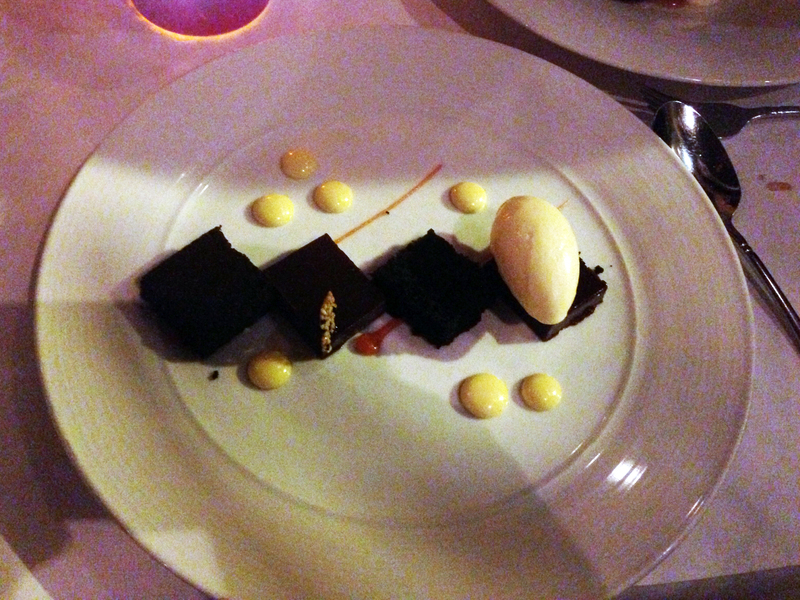 The devil’s food cake was spongy, the chocolate ganache was velvety rich as it alternated with the cake on the plate, and the cold ice cream added another dimension to the dish. While the Devils’ Food cake dessert came out really well (unlike a similar dessert executed by No. 9 Park in Boston), I sampled the “Toffee Pudding” and that blew me away. Again, the descriptions on the menu were so poorly written, that I had no idea that the “Toffee Pudding,” was actually a cake/bread pudding. When it came out, it was a warm spongy cake, saturated with toffee, and absolutely delicious. It’s just too bad that the menu listed the dessert as simply “pudding,” because I imagined a goopy Jell-O-like pudding on top of or next to a piece of cake. I would recommend either dessert, but the “Toffee Pudding” was incredible. I had a great time with my friends and the leisurely pace of the meal allowed us to really enjoy every moment. The high food quality and the complex takes on Southern staples made Bergamot unique. While I would recommend this restaurant if someone had never been there, I’m not sure I, myself, would return anytime soon. It’s not that the food or service weren’t good, it’s just that nothing really stood out to me as above and beyond. At this price point, there are a lot of other restaurants that do a better job of distinguishing themselves. Definitely worth giving it a try though because I think the menu changes every now and then.